Liuba Grechen Shirley formally launched Vote Mama, a PAC focused on helping moms run for office. Women, and particularly moms of young children, face unique challenges when running for office. Especially in those critical early months, moms face increased scrutiny from donors, establishment institutions, and the public. There are many PACs that focus on electing women— but Vote Mama is the only one focused solely on electing moms. 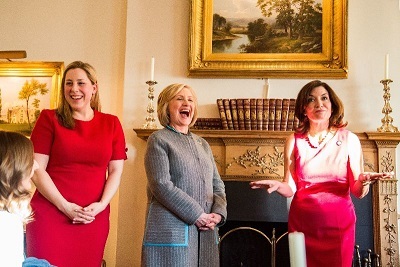 Special guests at the official launch last night included New York’s Lieutenant Governor Kathy Hochul and Hillary Clinton. Former presidential candidate Hillary Clinton received the International Unity Award at the Martin Luther King and Coretta Scott King Unity Breakfast in Selma, Alabama Sunday morning. Others in attendance at the breakfast were Sen. Bernie Sanders (D-VT), Sen Cory Booker (D-NJ), and Rev. Jesse Jackson. In a major shake-up to Bernie Sanders' just-launched presidential bid, some of his top strategists have left the campaign. Tad Devine, Mark Longabaugh and Julian Mulvey, partners in a political consulting firm who all played leading roles in Sanders' 2016 campaign for the White House, are parting ways with the senator, citing creative differences. "The entire firm has stepped away. We're leaving the campaign," Longabaugh told NBC News on Tuesday. "We just didn't have a meeting of the minds." Three of Senator Bernie Sanders’ top strategists have departed his 2020 campaign, citing creative differences. Although it’s been just a week since the launch, Sanders’ 2020 bid has been markedly successful in its grassroots outreach. In the first 24 hours of his campaign, Sanders received $5.9 million from about 223,000 donors. Within the first six days, one million people signed up to support his campaign. Sanders will still need to overcome reports that his 2016 campaign perpetuated a culture of sexism and harassment. The senator has twice publicly apologized for the alleged behavior, after first saying he was too busy to be aware of the mistreatment. but that never seemed to fit the occasion. Some 2020 candidates appear to be running on a theme similar to "Stronger Together"
including one politician who won fame and fortune by dividing us last time around and who continues to profit off stoking division in order to enhance his personal brand and build a hefty war chest (Donald Trump). Is "strength through unity" a winning message this time around? Will voters be fooled by a divisive politician like Donald Trump who co-opts and appropriates a former opponent's message out of pure ambition and jaded self interest? A friend who teaches elementary school told me about the Snow Day Calculator website. If snow is in the forecast, kids (and teachers!) check in several times a day to get the odds on the chance of school being closed. Help save London's Whitechapel Bell Foundry which dates to 1363. Does London really need another boutique hotel? Help stop NY based Raycliff Capital from destroying a piece of London's heritage. ANYONE can register an objection to the proposed demolition of the foundry and the construction of the "bell-themed boutique hotel" than will replace it.